Oil leviate regulates your sebum secretions, helping your skin feel less oily and in need of attention. It also ensures your cells are well moisturized and balanced, making your face feel smooth, healthy and quenched. oil leviate was added to your shopping cart. 1. Use Oil Leviate daily, morning and night, after treatment. 2. Pump 2 to 3 pea-size drops of Oil Leviate onto your palm. 3. Apply over your face and neck in up and outwards circular motions until fully absorbed. • It has a soothing or calming effect on sensitive skin. feel good using this product, worth to buy. Texture of this oil control gel is watery and easy to absorb into skin. After apply my skin do feel matte and not oily. Usually my face is oily within an hours after cleansing. Bliv moisturiser is the only watery among my others moisturiser which creamy or thick gel texture which makes me feel oily and the skin could not breath . Love Bliv product very much. It's always my first choice! i received this product as sample, and it worked really well on my skin. i noticed a significant effect on my nose as it is now matte and not oily and shiny after applying this product. i used this along with off with those heads and it helped reducing the oil that can cause blackheads. Love this product. It really refice the oil production on my face. Love this product on how it reduce the oily appearance on my face. got this as a sample and after applying it for a few days, it seems to do what it says - control oil, helps eliminate blackheads & whiteheads and, lightens up the skin. will be purchasing the full size one as i think I've found a new HG! i've got this for free sample due to my purchase of off with those heads. I'm interest in trying this product because it says it could also reduce acne scars. After finishing the sample, i realize my acne scars faded. Then i decided to buy the 30ml bottle. It absorbs fast into my skin. It also hydrates the skin and prevents it from becoming oily. For me, it lasts the whole day after applying it early in the morning. I am using this with squeaky clean so i am not sure which actually did the fading. However, combining this two products actually work for me and am happy with it. i've got this for free sample due to my purchase of off with those heads. I'm interest of trying this product because it says it can reduce acne scar also. After finishing the sample, i realize my acne scars were faded. Then i decided to buy the 30ml of this product. It absorb fast into my skin. It also hydrates the skin and prevents it from becoming oily. For me, it lasts the whole day after applying it early in the morning. I am using this with squeaky clean so i am not very sure which actually did the fading acne scar effect on me. However, combining this two products actually work for me and am happy with it. I received a sample of this products when buying off with those heads. My skin is oily- sensitivity. This product obviously can control my oily face without causing any irritation which I have suffered from lots of oil control products before. I'm really satisfied with this product. I tried a sample of this product. I have combination skin, oily for T-zone. Therefore I use it on my T-zone every morning and it will last till night~ Usually my T-zone got very oily at noon... I will buy this product after I finish my sample~ Bliv! You're awesome! This is a must use product during day time for me! After using this product for 3 years, it managed to control the sebum production on my face hence minimal blackheads, whiteheads and pimples formation! Amazing product for oily skin in summer! This gel has light texture, perfect for summer. I just apply it around my T-zone, and my nose can stay matte for the whole afternoon. Love it. This feels so light on my skin which is really nice because I have plenty of natural heavy oils. It does exactly what it claims to do - the dark spots from where my pimples were are clearing and fading, the amount of oil is controlled now that I've been using for several weeks and my pores stay unclogged. My skin looks more matte with this and I love using it within it's designed range. It works so well for my very oily skin type! I'll be re-purchasing more of this when the container runs out. This moisturizer is very good for Summer! My skin felt hydrated, soft, and brighten after using it. I like how it's non-oily, matt finish, lightweight, and absorb quickly. This product is more liquidly compare to "off with those heads". 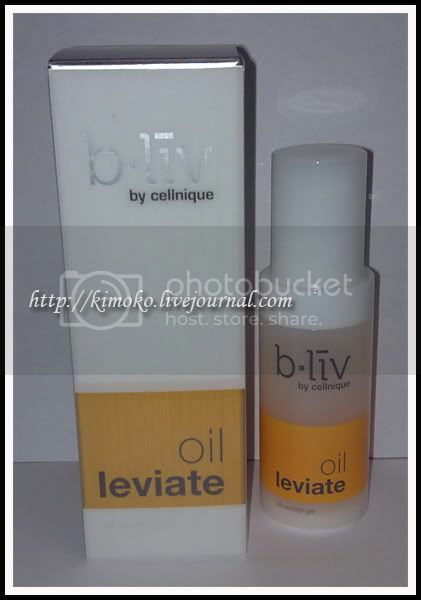 I was amazed how well this "Oil Leviate" controlled the oil on my face. Before i started using this gel, the oil on my face was just out of control, especially in this extreme heat and humidity weather im living in. After applying this product before leaving my home, i can definitely feel my face was a lot less oily after couple hours into the day. When you first apply on your face it also slightly tighten your skin, i think thats the secret of having a less oily skin! Great product! i've got this for free sample due to my purchase of shrink tighten+ serum. I'm interest of trying this product because it says it can reduce acne scar also. It absorb fast into my skin so i could apply my bb cream afterwards. It also not make skin matte or dry so i think it also hydrate the skin and keep preventing it from become oily. However i never know how many hours it can control the oil because after using it in the morning i always wash my face during the day. My conclusion is it helps control the oil but not much helps for fades acne scar as promise. i've just only started using oil leviate along with squeaky clean and off with those heads. initially, i didn't like how it was a gel because it felt odd on my skin compared to all my other lotion based moisturizers. but after a minute or so after application, my skin has never felt softer!